Newly formed U.S. distributor Pathe Exchange began releasing Paul Terry’s Aesop’s Film Fables in May 1921, and seemed determined to make sure it would be a successful series that would run for many years. This was ensured through payoffs to theater managers of the Keith Albee chain, and heaving advertising, particularly in New York papers. Some of these press snippets portray Paul Terry as a sort of wise cracking character, likely the work of freelance gag writers that were kept on the Fables payroll, a tradition that lasted into the John Foster era. “Mice in Council” is the second offering of the animated cartoon series of “Aesops Fables Modernized” created by the cartoonist Paul Terry and produced by Fables Pictures. It has been set for release by Pathe June 26. 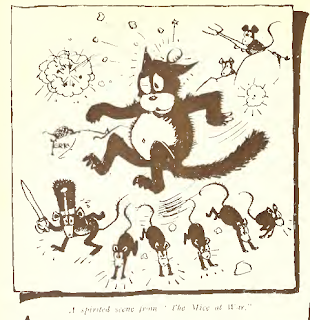 The marvelous skill of the artist in animating his subjects is further enhanced by his sense of humor, giving the animals human attributes, and having them perform antics of a highly imaginative sort. Owing to the great interest due to the approaching international bout between Jack Dempsey and Georges Carpentier, Pathe has scheduled “The Rooster and the Eagle”, of the animated cartoon series, “Aesop’s Fables Modernized”, for release July 3, the day following the big fight. The offering, produced by Fables Pictures, has a boxing bout, cleverly conceived by cartoonist Paul Terry, and settles the fistic championship in the animal kingdom. “The Rooster” is the Georges Carpentier of the picture, showing France’s national bird, Chanticleer, in action in the squared circle of the barnyard. Jack Dempsey, America’s champion, is represented by “The Eagle”, and enters the fray with triumphant results. Paul Terry, cartoonist, encountered a chemist friend recently. “You’ve cartooned a lot of insects in your film fables,” said the chemist. “GIve me a name for my new compound. It is a terror to insects.” “Why not call it Bugaboo?” asked Terry. Paul Terry, the cartoonist who draws all the funny animals and humans for “Aesop’s Film Fables” is called upon to answer many queer questions every day. The average film fan knows nothing whatever about the mechanics of animated cartoons, so he asks Terry. “Some one asked me the other day why I put more animals than humans in my drawings” said Terry. “I answered in the words of the butcher, who was asked how much horse meat he put in his rabbit sausage and said “Fifty-fifty - one rabbit and one horse.” “That’s as near as I could come to answering that questioner”. Paul Terry, who draws those clever “Aesop’s Film Fables” and Major Jack Allen, the wild animal roper, were casting repartee back and forth in the studio yesterday. “I suppose you’re a native son of Terryville, Conn.” opined the Major. “No” answered Terry, “I’m from a different Terry-torry.” “I’m from Baltimore” quipped Major Jack. “Oh,” shot back the cartoonist, “I thought they named Allentown, Pa., after you.” Then the radios became crossed and we heard no more. Paul Terry, who pens “Aesop’s Film Fables” for the screen, acted as best man for Herb Roth, the newspaper artist, when Herb stepped into double harness recently. 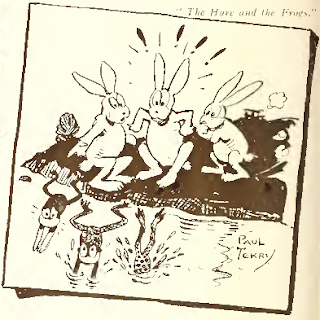 Paul Terry, the film cartoonist, was yesterday joyously showing about the copy of an essay on “The Frog” written by a Chicago school boy, and sent to the artist by a school teacher friend. Here’s what the boy wrote: “What a wonderful bird the frog are! When he stand he sit, almost! When he hop he fly, almost. He ain’t got no sense, hardly! When he sit he stand, almost!” Reads something like a subtitles, doesn’t it? Above: Henry Cat and the Pathe Rooster celebrate their anniversary in a 1925 ad.